I had been curious about this fast for some time so I was quite interested when it came available for review. The new year was approaching as I was finishing the book so I decided to begin a 7 day Daniel fast on New Year's Day. I did it somewhat lenient since I had never done one before. I realized that I am quite reliant on all of the non-approved foods for the mainstays of my diet. You must give up everything processed, dairy, meat, sugar, processed foods, and drink nothing but water. I think giving up coffee was the hardest thing for me. The fast helped me to break addictions that I had to certain foods and even cravings for certain foods. I remember more how bad those foods would make me feel and how much better I felt when I did not eat them. It genuinely made a difference in my overall well being. I also had some significant spiritual breakthrough with several things I had been trying to let go of. I highly recommend it. I didn't weigh myself because that wasn't really my goal. My husband, however, did. He lost 7 pounds and was still eating a little junk each day. All that changed for him was our meals and he lost weight. 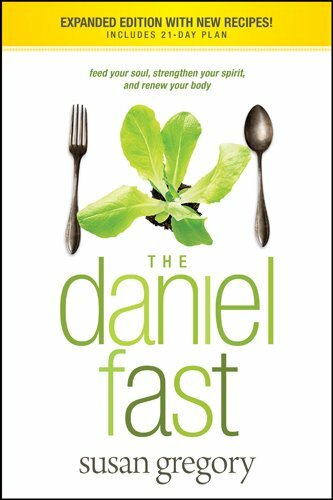 Try the fast for yourself and see what can happen when you break off the pull of food to focus on Christ.